The Constitutional Court rejected the constitutional complaint challenging the referendum on the opening hours of the "party district"
The Constitutional Court’s procedure was preceded by the local referendum initiative put forward by the members of the local government of district VII of the capital. The Local Election Committee’s decision authenticated the following question: “Do you agree with regulating by the body of representatives of the Local Government of Budapest Capital VII District Erzsébetváros the opening hours of businesses by banning the opening of catering businesses between 24:00 and 6:00 o’clock in the territory bodered by Károly Boulevard – Király Street – Erzsébet Boulevard – Rákóczi Street?” The petitioner company intiated the judicial review of the decision by referring to the alleged unlawful restriction of the relevant fundamental rights. The regional court had upheld the decision of the Local Election Committee and the petitoner turned to the Constitutional Court by challenging the regional court’s ruling. The petitioner claimed, among others, that the local government degree to be adopted on the basis of the referendum question would violate the rights of third parties, i.e the employees, suppliers, event organisers and artists working in the area affected by the referendum question. In the Constitutional Court’s opinion, the petitioner cannot be considered as an affected party in the present case. Moreover, in the constitutional complaint, the petitoner also made a reference to the violation of its own fundamental rights. In the petitioner’s opinion, the local government decree to be adopted on the basis of the referendum shall render it impossible to use and utilise the real estates owned by the petitoner, in accordance with its intentions and its obligations set out in the lease contracts, and the value of the real estates shall also fall significantly. 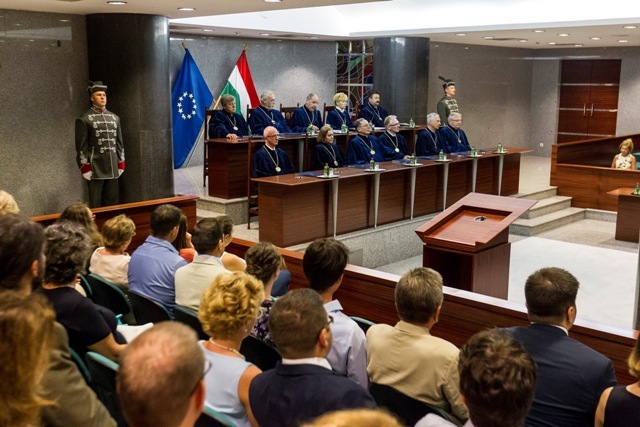 In its decison, the Constitutional Court points out that the regulation considered by the petitioner to be in conflict with the Fundamental Law is not existing yet in the Hungarian legal system, therefore it cannot serve as the basis of a constitutional complaint. The regulation shall only come into existence after more than half of the local constituents casting valid votes and more that half of the validly voting constituents giving an affirmative answer to the question posed and then the body of representatives adopting, within one hundred and eighty days from the day of he local referendum, a decree containing the restrictive regulation, i.e. all this is merely a contingency for the moment. Judges Dr. Imre Juhász, Dr. Béla Pokol, Dr. István Stumpf and Dr. Péter Szalay attached a concurring opinion to the decision. The full text of the decision of the Constitutional Court is available on the Constitutional Court’s website (alkotmanybirosag.hu).